Claire Danner Crispin, mother of four young children and nationally renowned glassblower, bites off more than she can chew when she agrees to co-chair the Nantucket’s Children Summer Gala. Claire is asked to chair the benefit, in part, because she is the former high school sweetheart of rock star Max West. Max agrees to play the gala and it looks like smooth sailing for Claire-until she promises a “museum-quality” piece of glass for the auction, offers her best friend the catering job, goes nose-to-nose with her Manhattan socialite co-chair, and begins a “good-hearted” affair with the charity’s Executive Director, Lockhart Dixon. Hearts break and emotions are pushed to the limit in this riveting story of one woman’s attempt to deal with loves past and present, family, business, and high-powered social pressures. 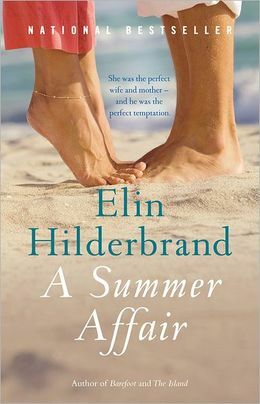 Elin Hilderbrand’s unique understanding of the joys and longings that animate women’s lives will make this her newest summer bestseller. I’ve read a few of her other books and enjoyed them so why not try another :). I wasn’t disappointed.